The Wednesday Night Team consists generally of 18-20 middle school students who are in their second or third year in the Youth to Youth program. The majority of members of this team are in grades 7 and 8. They meet once a week for two hours during the school year. Usually those meetings are from 5-7 pm and they meet nearly every Wednesday from October through May. Since all of the members of this team are experienced participants in Y2Y, their activities start to reflect more involvement in more complex projects and presentations. They are also given opportunities to learn, develop and display leadership skills. These students take on more sophisticated presentations that require strong presentation skills and the integration of media and audio visual. This team is the primary group responsible for teaching the History of Lies assembly to the entire 5th grade each year and TRUTH classes to 4th grade classrooms. 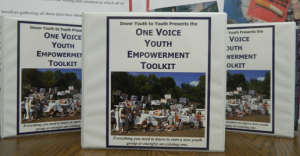 In addition, members of this team begin to be used in support of the older students in teaching more advanced material such as the 8 Things about Alcohol presentation or youth advocacy skills such as Presentation Skills. Wednesday night students are trained in the legislative process and are given opportunities to testify before legislative committees or in public hearings on ordinances. Often this occurs in a mixed project team of three middle and high school students where an older student is the project team leader. Team members participate in all of the major projects of Youth to Youth and often coordinate simple individual projects taken on by only their team. Members of this team are more involved and have more opportunities to record radio PSAs (although this remains the primary responsibility of the Monday Night Team which is comprised mostly of older high school students). They are sometimes asked to play roles in video PSAs being produced by older Y2Y students.